“A crucial ingredient of high-temperature superconductivity can be found in a class of materials that is entirely different than conventional superconductors. That discovery is the result of research by an international team of scientists working at the U.S. Department of Energy Office of Science’s Advanced Photon Source (APS). Superconductivity is a phenomenon that occurs in certain materials when cooled to extremely low temperatures such as -435° F. High temperature superconductivity occurs above -396 F, and has been seen up to -218 F in HgBa2Ca2Cu3O8. In both cases, electrical resistance drops to zero and complete expulsion of magnetic fields occurs. The entire crystal structure of the chemical compound CaCu3Cr4O12, an A-site ordered perovskite.No image credit. From Argonne APS: "Protein Structure Could Lead to Better Treatments for HIV, Early Aging"
“Researchers have determined the molecular structure of a protein whose mutations have been linked to several early aging diseases, and side effects for common human immunodeficiency virus (HIV) and acquired immunodeficiency syndrome (AIDS) medications. This breakthrough could eventually help researchers develop new treatments for these early-aging diseases and redesign AIDS medications to avoid side effects such as diabetes. The research was carried out at the Southeastern Regional Collaborative Access Team(SER-CAT) facility at the U.S. Department of Energy Office of Science’s Advanced Photon Source (APS) at Argonne National Laboratory. Ribbon diagram of the Ste24p protease. The researchers from the University of Virginia School of Medicine, the Hauptman-Woodward Medical Research Institute, and the University of Rochester School of Medicine and Dentistry determined the molecular structure of the enzyme Ste24p. Their Membrane Protein Structural Biology Consortium is funded by the National Institutes of Health Protein Structure Initiative, which supports the determination of molecular structures of biomedically important target proteins. Their findings were published March 29 in the journal Science. “Observing the evolution of a particular type of antibody in an infected HIV-1 patient has provided insights that will enable vaccination strategies that mimic the actual antibody development within the body. 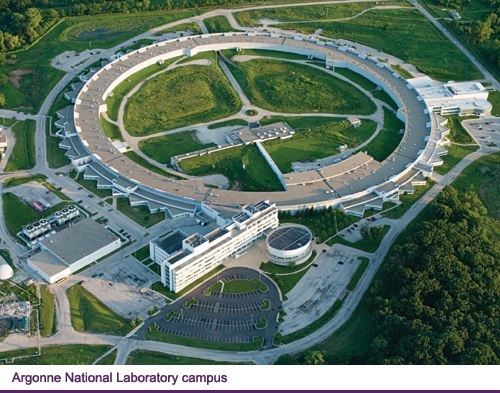 Spearheaded by Duke University, the multi-institution study included analysis from Los Alamos National Laboratory and used high-energy X-rays from the Advanced Photon Source at Argonne National Laboratory. 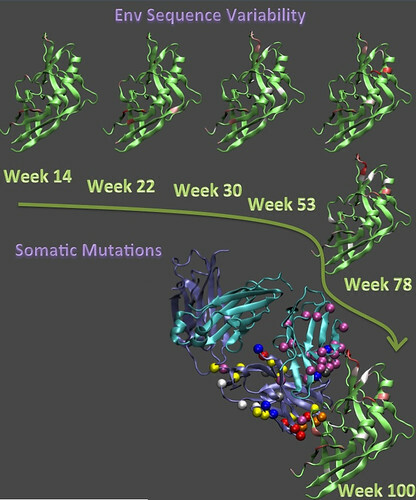 The evolution of the viral protein (green) from 14 weeks through 100 weeks post-transmission is compared with the maturation of the human antibody. The kind of antibody studied is called a broadly cross-reactive neutralizing antibody, and details of its generation could provide a blueprint for effective vaccination, according to the study’s authors. In a paper published online in Nature this week titled Co-evolution of a broadly neutralizing HIV-1 antibody and founder virus, the team reported on the isolation, evolution and structure of a broadly neutralizing antibody from an African donor followed from the time of infection. The observations trace the co-evolution of the virus and antibodies, ultimately leading to the development of a strain of the potent antibodies in this subject, and they could provide insights into strategies to elicit similar antibodies by vaccination. Patients early in HIV-1 infection have primarily a single “founder” form of the virus that has been strong enough to infect the patient, even though the population in the originating patient is usually far more diverse and contains a wide variety of HIV mutations. Once the founder virus is involved in the new patient’s system, the surrounding environment stimulates the HIV to mutate and form a unique, tailored population of virus that is specific to the individual. From Argonne APS: "Shedding Light on Chemistry with a Biological Twist"
The isomerization of a small molecule caged inside a photoactive protein recorded by time-resolved x-ray crystallography reveals a detailed sequence of events (represented by dominos) composed of a short-lived intermediate (red) whose reaction trajectory bifurcates along bicycle-pedal (left) and hula-twist (right) pathways. No image credit. “When it comes to understanding how proteins perform their amazing cellular feats, it is often the case that the more one knows the less one realizes they know. For decades, biochemists and biophysicists have worked to reveal the relationship between protein structural complexity and function, only to discover more complexity. One challenging aspect of protein behavior has been the speed with which they change shape and interact with their neighboring biomolecules. Until recently, researchers have relied on a somewhat static approach, using freeze-trapping to capture protein intermediates at various steps along a biochemical pathway. But exciting breakthroughs now allow us to watch proteins changing in real time. “Materials scientists have been for some time preparing artificial ceramic systems that simply do not exist in nature, allowing scientists to engineer particularly interesting and even technologically applicable behaviors. But sometimes nature itself finds ingenious solutions to physical problems that we have not been able to solve. The simple perovskite structure of EuTiO3 illustrated above shows the essential competing structural instabilities. At the center of the figure is the oxygen cage rotation, and to the right is the central titanium displacement. X-ray diffraction studies showed that, to accommodate the incompatibility of these distortions, they naturally form a long, inter-digitized superstructure (illustrated at far left), which allows them to coexist. Ultimately, this research demonstrates that when both electric and magnetic fields are applied as the europium spins align, the oxygen cage responds, mediating communication between the titanium electric and europium magnetic parameters. An international team of researchers lead by Argonne National Laboratory utilized high-brightness x-rays from the U.S. Department of Energy Office of Science’s Advanced Photon Source at Argonne National Laboratory, as well as the European Synchrotron Radiation Facility (ESRF), to study the rare-earth magnetic material europium titanate (EuTiO3). Their results were published in the journal Physical Review Letters. In a magnetic field, the (near) optical properties of EuTiO3 change quite dramatically, presenting hope of a strong magneto-electric material often dreamed of by engineers for use in combining magnetic and charge parameters for many memory, processing, and sensor devices. “In the never-ending battle between antibiotic developers and the bacteria they fight, scientists at the U.S. Department of Energy’s (DOE) Argonne National Laboratory have made a key breakthrough that could allow for the development of new drugs to more effectively combat antibiotic-resistant ‘superbugs’. NDM-1, present in a number of pathogenic bacteria, including Klebsiella pneumonia and Escherichia coli, is able to defeat many of the world’s most widely used antibiotics, including penicillin derivatives, cephalosporins, monobactams and carbapenems. An Argonne team led by Youngchang Kim of the Structural Biology Center, in collaboration with researchers from the Midwest Center for Structural Genomics, the University of Texas-Pan American and Texas A&M University, recently determined the structure of NDM-1, a harmful enzyme able to overcome several antibiotics. The team used a combination of X-ray crystallography at Argonne’s Advanced Photon Source (APS), biochemical assays, and computational modeling using resources at two Texas universities. ‘These kinds of enzymes can recognize many different targets,’ said Andrzej Joachimiak, head of Argonne’s Structural Biology Center and the Midwest Center for Structural Genomics. Sorry, I do not know what you mean. I gave Writer credit, and a link to the full article. Please tell me what you are looking for. “The chemical reactivity of molecules in solution critically depends on a complex interplay among intramolecular processes and interactions with the caging solvation shell, which surrounds a solute molecule. Accordingly, the influence of solvation on the reactivity of chemical and biological molecular species has been the subject of increasingly intense research. Ultrafast time-resolved x-ray measurement techniques that combine picosecond lasers and short-pulse x-rays in laser pump/x-ray probe experiments are powerful tools for studying this interplay in photo-active molecular systems. X-ray absorption, emission and diffuse scattering data acquired in a single experiment using MHz pump-probe repetition rates. By including x-ray diffuse scattering, the researchers could detect an ultrafast change in the solvent density (lower right, blue points) upon photo-excitation of the solute. Such time-resolved laser pump/x-ray probe experiments have been carried out at synchrotrons for several years; however, few have been able to make use of the full x-ray flux available, often because of the low (kHz) repetition rate of amplified laser systems. Thanks to implementation of a high-repetition-rate (54 kHz–6.5 MHz), high-power (>10 W) laser system at the X-ray Science Division 7-ID-D beamline at the Advanced Photon Source (APS), it has become possible to fully match the repetition rate of the laser to the 6.5-MHz rate of the x-rays, and thus to more efficiently use the flux provided by the APS. This has enabled laser pump/x-ray probe measurements incorporating simultaneous x-ray spectroscopy and x-ray scattering techniques to study light-induced intramolecular processes and solvent interactions in challenging molecular systems. It is accomplished by simultaneous, time-resolved utilization of several complementary analytical techniques that all take advantage of the thousand-fold increase in useful x-ray flux provided by the MHz scheme. 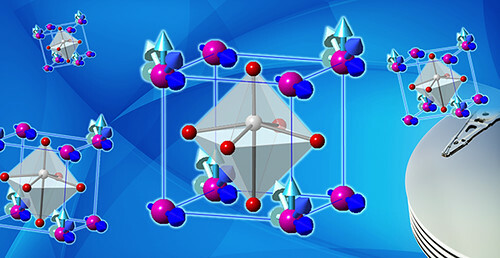 Researchers from the Technical University of Denmark, the Hungarian Academy of Sciences, the European XFEL at DESY (Germany), Argonne National Laboratory, the University of Copenhagen, SLAC National Accelerator Laboratory, and Lund University (Sweden) designed such an experiment for a highly detailed study of the photoinduced low-spin (LS) to high-spin (HS) conversion of iron(II)-tris(2,2′-bipyridine), [Fe(bpy)3]2+, in aqueous solution, to provide information on the interplay between intramolecular dynamics and the caging solvent response on a 100-ps time scale. “Although scientists have been aware that magnetism and electricity are two sides of the same proverbial coin for almost 150 years, researchers are still trying to find new ways to use a material’s electric behavior to influence its magnetic behavior, or vice versa. An illustration of a titanium-europium oxide cage lattice studied in the experiment.Image by Renee Carlson. Magnetoelectrics get their name from the fact that their magnetic and electric properties are coupled to each other. Because this physical link potentially allows control of their magnetic behavior with an electrical signal or vice versa, scientists have taken a special interest in magnetoelectric materials. ‘Electricity and magnetism are intrinsically coupled – they’re the same entity,’ said Philip Ryan, a physicist at Argonne’s Advanced Photon Source. ‘Our research is designed to accentuate the coupling between the electric and magnetic parameters by subtly altering the structure of the material.